The Lending Optimizer app offers loan program for remodeling from various lenders. Simpalm has designed and developed this Optimizer app for Optimized Lending Solutions. This App offers several benefits to borrower by comparing hundreds of loan program quickly and accurately estimates payments. The App helps lenders match their program to the types of borrowers. 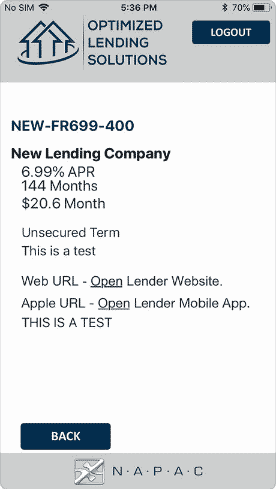 We have developed Lending Optimizer App for both iOS and Android platform. The app is available on both App Store and Google Play to download at no cost. Allow borrower to view specified load programs through sort/filter tool. Allow borrower to compare different loan programs to find the best option. The Optimizer calculates an estimated payment on every job based on the unique payment factor for each loan. The Optimizer also takes into account the expiration date of loan specials and constantly updates with new loan programs. 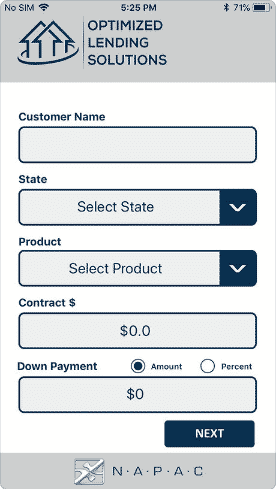 Client came to us to build an app that can work with sales associates in the field who wanted to display various lending option to customers doing remodeling of the house. Client wanted to build the app that works fast and in offline mode in the field, since internet access is not available at several locations. We listen to client carefully and proposed a solution by doing the wireframes and visual designs so that the client could review the app flow. Once the designs were approved from client, we started to do the development of both iOS and Android App together along with the Backend/Admin Panel. We assigned a PM, iOS Developer, Android Developer, Web developer to build different components of the application. We first coded the front end UI of the apps with all the screens to show the full working flow of the apps and then implemented functionality in the app. Final testing and debugging was done by out team and we uploaded the apps to the app stores. Currently we are supporting both the apps. Optimizer has features like Loan Programs, Loan Comparison, Lender and Borrower Interface.